Winter is the perfect time to get out the slow cooker to make some tasty meals that are healthy, hearty and will keep you warm. 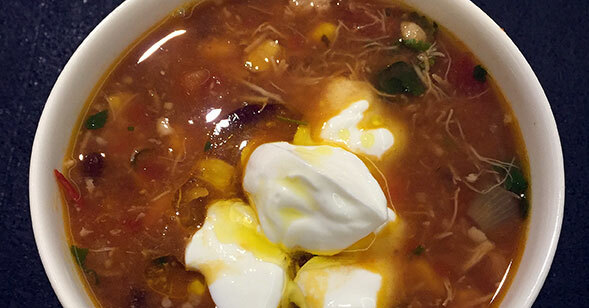 Below is a delicious soup recipe that I love. You can put it on before you head to work, and you will have a delicious meal waiting for you when you return! 2tbsp vegetable stock paste (I make my own vegetable stock paste. You could also substitute the water and vegetable stock, for chicken stock). Place the chicken thigh in to slow cooker bowl. On top of the chicken place all of the other ingredients on top of the chicken, except for the coriander and yoghurt. Mix the vegetables, stock and seasoning together. Turn on slow cooker on ‘low’ and cook for 8-10 hours. Spoon the cooked soup in to a serving bowl and using a fork, shred the chicken. It should easily fall apart with a fork). Place in to serving size bowls and add a tablespoon of greek yoghurt and tablespoon of flaxseed oil to serve.